Congratulations on your purchase of the FlexTT6 for Canon DSLR cameras and flashes. You can use the FlexTT6 Transceiver to control single or multiple off-camera electronic or intelligent TTL flashes. The PocketWizard ControlTL® System takes the complex TTL data being sent through the camera’s hot shoe and digitally interprets and transmits it as a reliable radio signal. You can now place TTL or manual flashes anywhere to illuminate the scene: Around corners, out-of-sight and in bright sunlight. 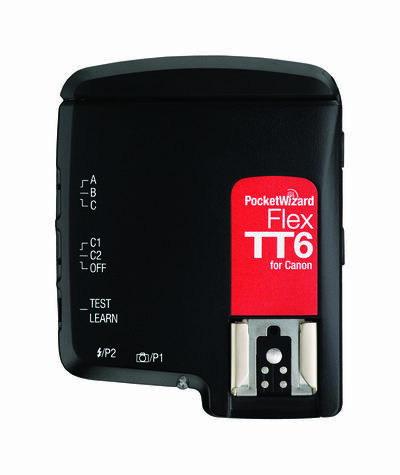 The FlexTT6 is compatible with any PocketWizard radio including the Canon MiniTT1 and FlexTT5 for triggering manual flash or remote cameras. Please see PocketWizard Compatibility section for more details on PocketWizard cross-compatibility. The Canon-specific FlexTT6 radio works within the Canon E-TTL II system. All references to TTL are exclusively for the electronic or intelligent TTL systems specific to Canon (E-TTL II)), and not film TTL. This page was last modified on 30 January 2018, at 10:22.